I don't even really like blue that much. 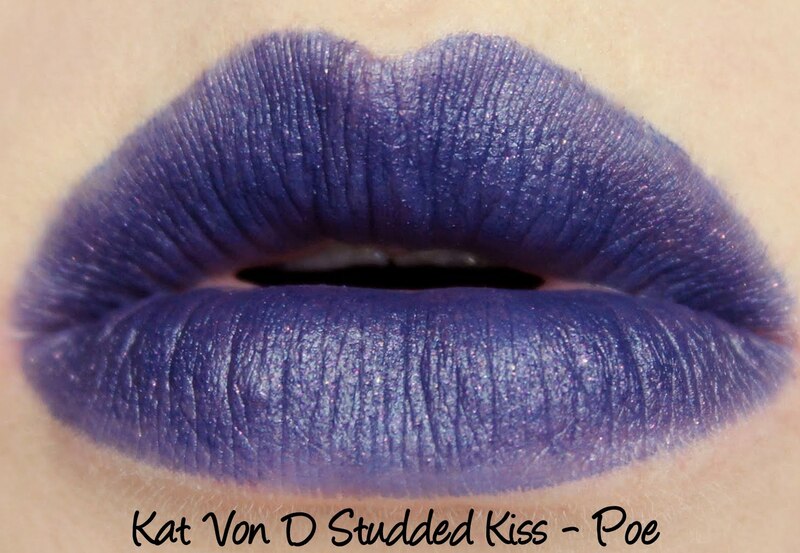 Yet like many others, I found myself bewitched by Poe, the intense navy shimmer in Kat Von D's revamped lipstick line. I told myself I'd never wear it - it would be unflattering - people would give me strange looks on the kindy run! But I threw caution to the wind and bought it anyway, and I'm so glad! The Studded Kiss lipsticks come in a black box with a slightly raised embossed studded effect to match the lipstick within. Poe is an intense navy filled with a multitude of sparkles - I spy magenta and gold, just for starters! The colour payoff is lovely, although I found application kind of odd. It's definitely not the 'one swipe coverage' the brand promises, as the first layer goes on as a mostly opaque blue tint and has very little shimmer (you can see a bit of this at the bottom of my lower lip) and then you need to sort of press the second layer on for the shimmer to translate. It's worth it, in my opinion, as the end result is absolutely stunning and considering we're talking about blue lipstick, I don't think it's very jarring either. That being said, I did pair Poe with tones that I know suit me on lips and cheeks, so keeping the rest of your makeup balanced and flattering is likely the key to 'pulling off' these shades (I put that in quotation marks because really, pulling things off just comes down to wearing what you love, right?). The glitter in Poe gives it a little bit of grit which I can feel while applying - it's not too abrasive, though. I didn't notice any unpleasant texture once it was on the lips and the glitter doesn't travel all over your face over the course of the day. Poe wore for six hours on me, although it looked a bit faded in the center after four hours and a little muddy around the lipline after five. It didn't feather or migrate per se, it just looked less crisp. I found Poe really comfortable to wear, it wasn't drying in the slightest. 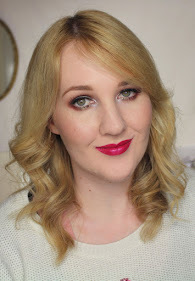 Quite a bit of sparkle lingered on the lips after the lipstick had faded. 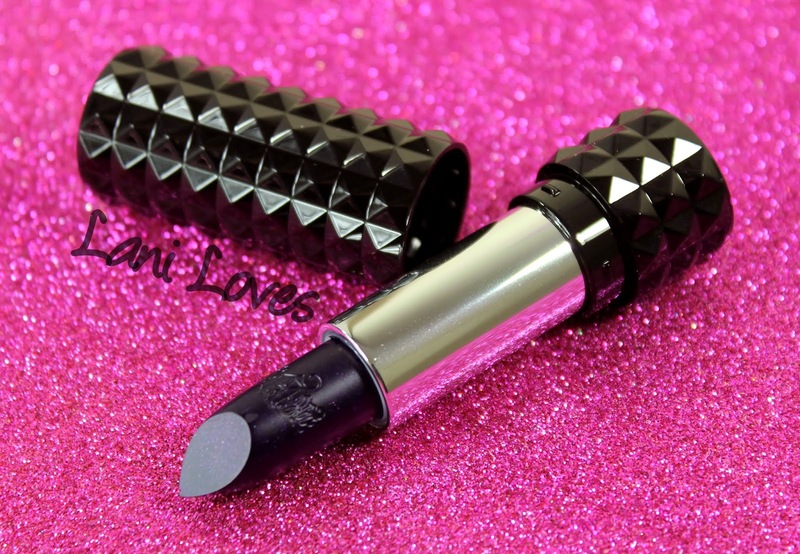 The Studded Kiss lipsticks have a creme brulee scent, which is ridiculously delicious and I may or may not be sniffing a tube of it as I type this. If you love the scent of MAC lipsticks, this is one step above. Heaven. What do you think of Poe? Would you rock this shade? This is just stunning!! 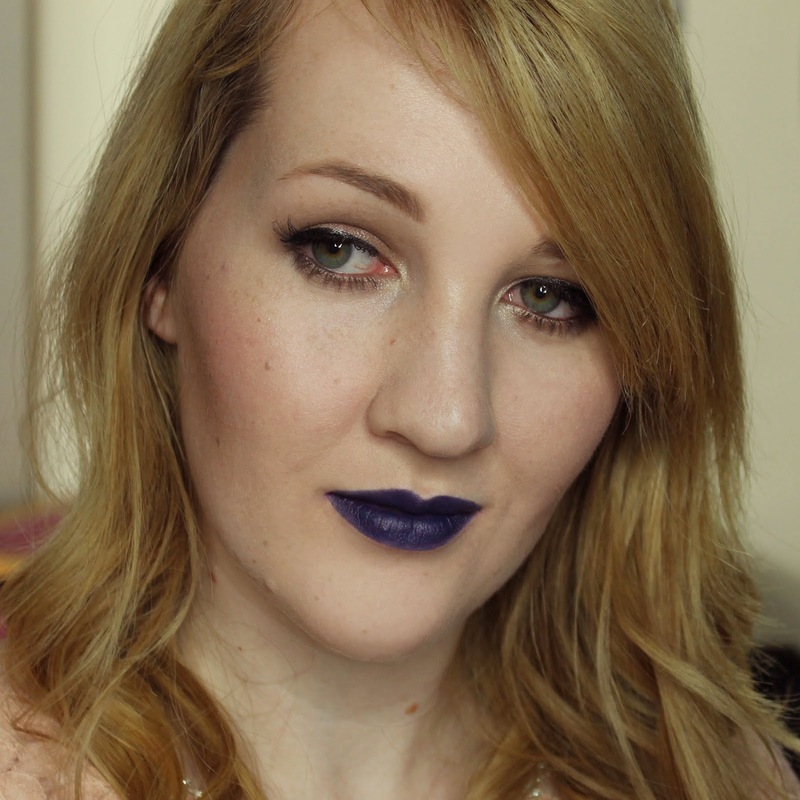 I'm still too scared to really wear purple lipstick, so blue would be too scary but it's so incredible looking! I've been eyeing her lipsticks, I love her tattoo liner! What a fun unique shade! I am super jealous! This has been a HG item for me since it came out. It looks surprisingly easy to wear too. Do you mind if I ask, did you get yours through Sephora? I know its hard to find! 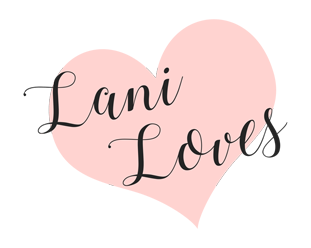 I was blown away by how wearable it was! Yes, I got it from Sephora :) A very kind friend ordered it for me in the States and shipped it over.